At the Reading Chiropractor we are strong believers in the benefits of short frequent simple exercise such as walking, cycling and swimming. This can help when suffering with aches and pains, but also in the prevention of such symptoms. Many of us spend at least 10 hours a day sitting at a desk or lounging on a couch, leading to a “sedentary epidemic”. Research by the British Chiropractic Association lays bare the extent of back ache among Britons. It finds 56 per cent of people older than 55 say sitting still for too long is the biggest cause of back pain with 27 per cent admitting to daily agony. The crisis is costing the economy billions of pounds in sick leave with 31 million working days lost last year due to back and ­muscle problems. However, the situation is largely self-inflicted with many of us ­sitting for too long at our com­puter screens in bad posture. The BCA says walking could be a cheap and effective cure for millions. It is less strenuous on the joints than other forms of exercise and helps maintain bone density, it says. Even adding just a few minutes walking to daily routines ­— such as taking the stairs instead of the lift — could provide relief from the pain. Chiropractor Tim Hutchful says: “As you age it’s important to maintain a healthy lifestyle and the sooner you commit to being more active the better. Hitting 50 is the age when millions notice a loss of fitness and begin to put on weight, placing added pressure on the spine, joints and muscles. Carrying extra pounds can lead to pain in the upper, middle or lower back causing health problems. In your sixties it is common to experience degeneration of the joints, discs and other spinal tissues with osteoarthritis affecting the back. 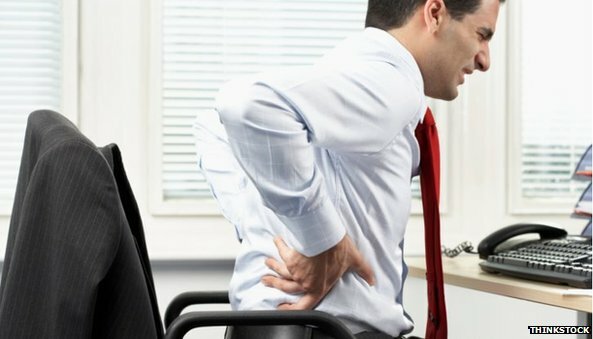 Our increasingly sedentary lifestyles are believed to be leading to an epidemic of back pain that has seen 2.5 million people suffer daily agony. Complaints of back and neck pain are up 10 per cent on last year. But simple adjustments, such as sitting correctly at work and in the car can produce relief. Workers should also take regular breaks and stretch regularly. Drinking water instead of tea or coffee also helps by keeping the body hydrated. The BCA advises people to walk so the heel strikes the floor first, allowing the foot to act as a shock absorber and helping to propel the person. People of all ages can be affected by symptoms of neck and back pain, and due to an increase in sedentary lifestyles and decreased exercise, it would appear that aches and pains are on the increase, especially amongst younger people. The article below (published in the mirror here http://www.mirror.co.uk/news/uk-news/back-pain-soars-among-young-5506295) describes how back pain is on the increase due to our modern lifestyles. Back pain soars among young people because they are sitting down for too long. A sedentary lifestyle and a change in working habits mean more people are complaining of spinal pain – particularly the young. The number of young people living with back or neck pain has risen to nearly half in a year – caused by long periods spent sitting at computers. The British Chiropractic Association found that 45% of 16 to 24-year-olds have neck or back pain, compared to 28% of 18 to 24-year-olds last year. Across all ages, 86% of people polled were in pain compared to 77% the year before. A quarter suffer on a daily basis. A sedentary lifestyle and the fact 59% of people now work sitting down are believed to be the main causes. The BCA urged people to sit up, take desk breaks every 30 minutes and stay hydrated. he top of the computer should also be level with eyebrows and the chair tilted forward so the knees are below the hips. Chiropractor Tim Hutchful said: “Our modern lifestyle is forcing us to stay seated. “Sitting causes up to twice as much pressure on discs on the spine as standing so, as a nation, we’re vulnerable. The Reading Chiropractor treats people of all ages, call us to see if we can be of help on 01189 394040.